John Gizzi was running late to yesterday's White House press briefing. In fact, a camera briefly captured the Newsmax White House correspondent squeezing into a row of seats while Press Secretary Sarah Huckabee Sanders was fielding questions. But almost as soon as Gizzi sat down, he raised his hand, and Sanders immediately went to him. "That was such good timing," quipped Anita Kumar of McClatchy Newspapers as the room broke into laughter. "He's closer today," said Sanders. "You're moving up in the world, John. And it scares your colleagues, I think. You're making them nervous." But it was only for a day. 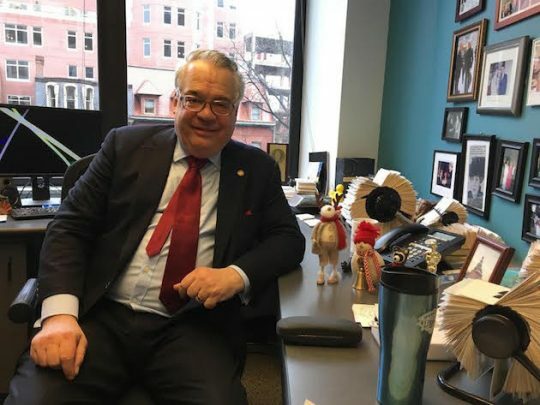 "Chris [Johnson] from the Blade was in my seat, and I didn't want to make him move since he sat down on the basis of my tardiness," Gizzi explained over email. "So I spotted April Ryan's seat was empty and moved in—third from top! Back to normal today." As I mentioned in my profile of the veteran correspondent, Gizzi's questions cover a vast expanse. He's a voracious reader. "I love newspapers in the morning," he told me during our interview. "I do not shave without reading the Financial Times in the morning, I love it. I love Bloomberg BusinessWeek…. Foreign Affairs, I’m a regular reader of, and I clip things, and I still keep files. Obviously whatever you think of the editorials, you have to read the [Washington] Post and the New York Times." Gizzi's advice to aspiring correspondents: "First of all, knowing a topic, if they can come back at you with something, you know your topic well. Second, say it briefly. There have been a few times—not many—where I’ve talked on, and that’s not fair to my colleagues when you talk too much about that." And he's not a fan of yelling either, citing Dan Rather as an example during the Nixon administration. Then [President] Jerry Ford came in and Jerry terHorst, who was his press secretary, he was with the Detroit News. He would tell people, "You don’t shout. You raise your hands. I won’t call on you." And that tradition has held through presidents since then. Sam Donaldson, under Reagan, would shout at him. "Hold on, Mr. President!" And that’s where Reagan would go [Gizzi gestures to his ear, pretending he can’t hear]. And then he got a hearing aid and he said, "I still can’t [Gizzi pretends something is wrong with the hearing aid]." He never took questions at the helicopter the way Trump does. "You're not there to be a showman," said Gizzi, who took that advice from his mother. Aside from a dose of humility, Gizzi urges young reporters to "never get discouraged. Never lose sight of your goal. Take your lumps and get back in the ring." Gizzi would be an ideal author for a Letters to a Young White House Correspondent (the Art of Mentoring series by Basic Books is mostly excellent). It's something he could do when he retires—not that he has any plans of doing that soon. "George Putnam, who started doing radio recording in the news in the early ’30s, went on to be one of the first television anchors in the late ’40s and was putting me on as a guest on radio before he died at age 93. He wanted to die in the studio and did," Gizzi recalled. So it's a book he can do 30 years from now. This entry was posted in Politics and tagged John Gizzi. Bookmark the permalink.